Across the Charles River from Sewall Ave. is our mixed-use renovation of 545 Cambridge Street in Cambridge, which is nearing completion. Located on the corner of 7thStreet along multiple bus routes and less than half a mile from Lechmere Station on a stretch of Cambridge Street peppered with restaurants and shops, this project is sited in the heart of East Cambridge. 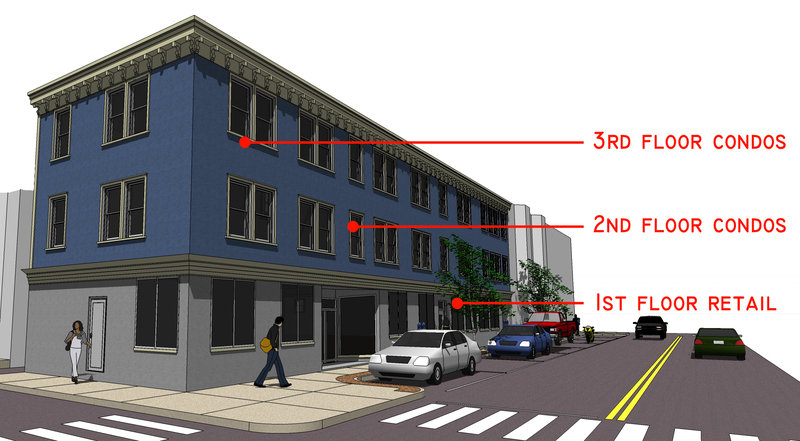 The three-story project consists of three commercial spaces at street level with four condominium units on the top two floors (two 800 s.f units and two 1200 s.f. units.) The second and third floors were originally office spaces, however the entire building had been gutted when we first became involved in this project. Our adaptive reuse of the existing empty shell maintains the exterior character of the building while transforming its use into residences for urban dwellers – adding residents to this already vibrant neighborhood of East Cambridge that is bustling day and night. Rendered view from the corner of Cambridge & 7th. One of the particular challenges of this project was the need to provide an additional means of egress (required by the change in use) without increasing the existing building footprint, which covers most of the site. To address this, we inserted a new egress stair and corridor (with storage spaces for the condominiums) above an existing rear exit door which feeds into a driveway and side street. The existing egress door is thereby able to accommodate the additional egress requirements for the condominium units above, enabling the creation of this mixed use design. Before and after: 1.) the existing building, 2.) the insertion of the stair tower, and 3.) the result.